Chris Burniske, author of the must-read book, Cryptoassets, and partner at Placeholder Management has laid out his thesis for their investing proess. This is a worthwhile read for anyone looking for a systematic way to invest in cryptoassets. “The currency they were after was virtual, but the guns they carried were anything but,” so starts this article describing the lengths that criminals will go to steal and holders to secure cryptocurrencies. In a first of its kind, half a dozen ICO companies have come together to collaborate on a new fund that plans to pay out more than $100 million to promising projects in the Ethereum crypto space. Bitfinex, the cryptocurrency exchange riddled with controversy that has been covered in previous CoinSnacks issues, has announced they are launching EOSfinex, a decentralized exchange (DEX) on the EOS platform. Regardless of your opinion of the financial state of Bitfinex, this is a major step forward for the EOS platform. Chris Dixon lays out exactly why the decentralization aspect of cryptoassets is so important, yet so misunderstood. Decentralization is not only favored to resist government censorship, or because of libertarian political views, but because it allows for an open and level playing field for developers and entrepreneurs to build the projects of the future. Historically, bond investing has been very lucrative for Wall Street by allowing it to play the middle-man between companies (raising debt or equity) and investors. Now with smart contracts on the Ethereum blockchain, companies may be able to bypass the middle-man and sell bonds directly to investors for not only much smaller investment amounts, but also zero fees. Kyle Samani of Multicoin Capital has published his thoughts on two token economic models that address the ‘velocity problem’ for utility tokens, ‘Work’ and ‘Burn and Mint’ (BME). This very in depth review is useful to anyone interested in how different models of network usage growth will lead to growth in the value of tokens. Quoted by various media outlets, the country’s minister of the office for government policy coordination, Hong Nam-ki, released a statement in response to last month’s public petition against harsh regulation or an outright ban on cryptocurrency trading. Because ICOs are still a new phenomenon for many regulators, the laws and rules about how to govern and regulate them are still being formulated. In fact, some governments have only just recently made any public statement regarding them. This article lists how countries are responding from those who are regulating to those who are simply issuing warnings. Here’s our current BTC chart. As shown, the price has moved back to the 50 day moving average, while also approaching the upper boundary of the downtrend channel. 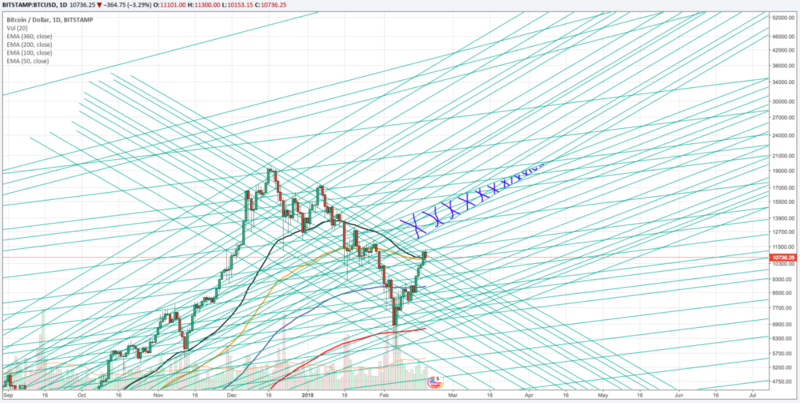 If we don’t break through the downward trend channel, then be prepared for another downward move, which potentially doesn’t resolve itself until the end of March when the vertex of the 2 channels occurs (intersection of the upper boundary of the downtrend channel with the lower boundary of the up-trending mini-channel).